When it comes to taking photos, I like taking the candid moments, when people are just talking, eating, doing things normally, everything without having to pose for the camera. Posing is fine, but I often ask people NOT to look at the camera when I'm snapping photos. I want... REALISM. I didn't have my camera with me, I think I left it in Tokyo. So I used my sister's Nokia N78 instead. 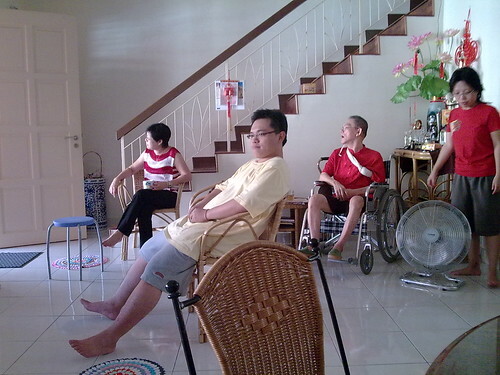 The first day of Chinese New Year, as usual, was a visit to my uncle (dad's elder brother's) house. He and his family used to live in Malacca before moving over to Shah Alam 2 years ago, which is great, because going to his place takes only around half an hour as compared to nearly 2 hours in the past. The entire family from my father's side were gathered, on that day, at my uncle's place. My dad's elder brother and his wife, my dad's eldest sister and her husband, my dad's youngest brother, my cousins, my cousin-in-laws, and the like. Seeing that one of my cousins is pregnant, I know that there will be more people at the family gathering next year. Just some snapshots from my uncle's house. The food, as always, was wonderful. 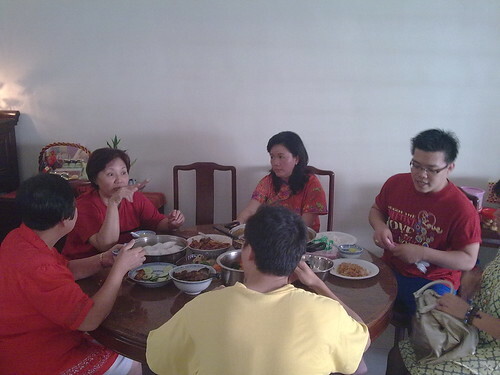 Here's mom (middle, in red), chit-chatting with my aunts (dad's eldest sister and sis-in-law) along with my two cousins, Ah Woo and Ah Miang. From the look of her face, I can know that mom's listening to some grisly details of our family secret. 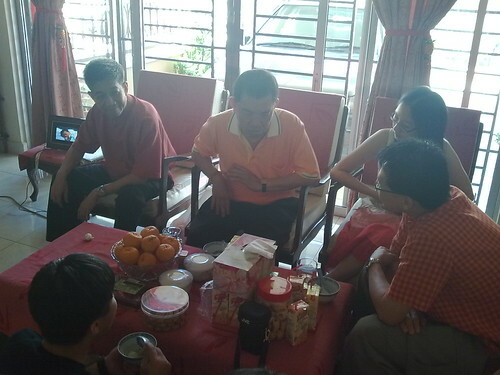 And here's dad, chatting with my uncle (dad's brother-in-law) and my cousin Hwee Suan + her husband Timothy. A wider shot of the house. My sister has a similarly "huh?" expression on her face like mom. I'm sure she was listening to more dark secrets of the Yeo family from my uncles that she never knew about until now. 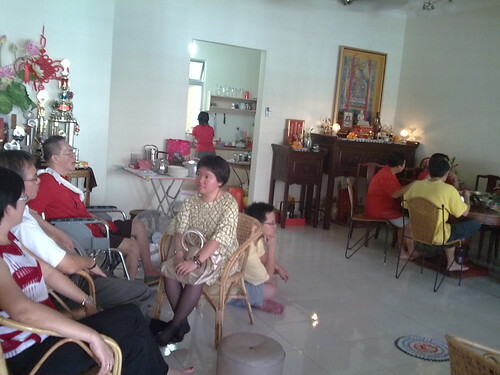 On the second day of Chinese New Year, just before we headed off to mom's hometown, Ipoh, we made a stop at my aunt's (dad's eldest sister) house (I shot a video of us visiting the same house during the Chinese New Year three years ago). 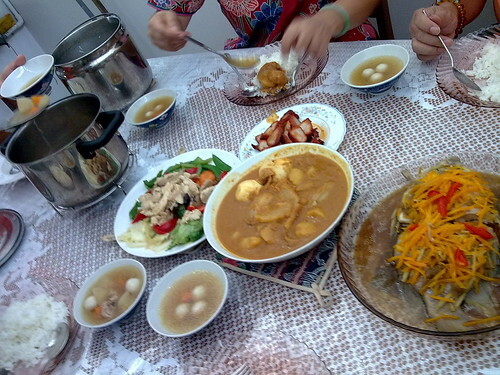 My aunt has AWESOME cooking skills, like most people in the family (I will not name the notable exception, I can only hint that my short film, CHICKEN RICE MYSTERY, isn't entirely fictional). Updated (September 2, 2012): Zard is a pop group. And Izumi Sakai was its lead vocalist and leader. I always referred to her as Zard because to me, she WAS Zard. But I decide to revise this blog post so that I can try to separate the Sakai the person, from the group. I was pretty shocked when I read about singer-songwriter Izumi Sakai's death on today's newspapers.